One of the first horses I trained was Scrapper. 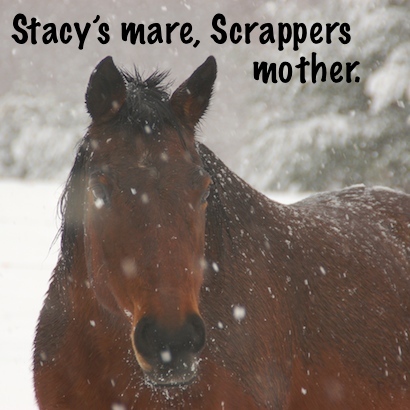 When I was a teen I bred my mare once and Scrapper was the resulting foal. 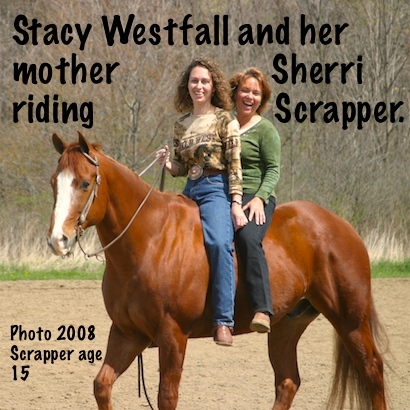 As a sophomore in college I took Scrapper with me to start under saddle and to train. I was learning, Scrapper was learning and I made a lot of mistakes. One of those mistakes was being bad with my hands. When I wanted to turn I moved my hands too quickly and didn’t use my legs to help signal. I failed to plan ahead and tried to maneuver my horse like I would my own body. My problems transferred to my horse and Scrapper chomped at the bit and was inconsistent with his headset. I was frustrated which made it even harder for me to move my hands slower. I say all of this not because I am proud of it–I am not. I do, however, know what I did wrong and I have built into my program things to fix these common mistakes. When I demonstrate in Episode 18 that I use only my inside rein while resting my outside rein on the saddle horn -I am breaking a habit. Many people don’t know how to properly use the inside rein only for control. Don’t believe me? Try the exercise at 6:50 with your broke horse. Pay attention to your outside hand that should be resting on the saddle horn. Can you feel how that hand wants to ‘help’? That is what breaking an old habit feels like. You should be able to do all of these exercises on any riding horse. Some of the problems will be the horse, some of them will be you. Go back and watch Episode 21…23 and 24 and the rest of the riding episodes – pay attention to my hands and Jac’s mouth. 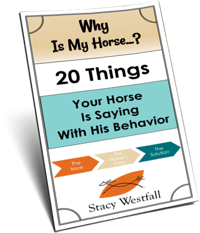 You will be able to see other tips and methods I use to break habits and retrain bodies and minds of both riders and horses. Alex, the episode you were asking about, Episode 13, shows Jac quickly accepting the bit and achieving a quiet mouth. Most young horses will accept the bit quietly when using these methods. If they don’t the first thing I look at is physical issues: sharp teeth, need chiropractic, etc. Many older horses have experienced the mistakes I described with Scrapper. These are training issues and may have also become habit. Check for physical issues by consulting an equine dentist and vet. If the pros find nothing wrong and you believe it could be mistakes like the ones I made with Scrapper, don’t lose hope. Scrapper’s story did have a happy ending. After two years of improving myself and retraining Scrapper you would never have known he had once been so busy with his mouth. Retraining would involve going through ALL of the steps shown in the Stacy’s Video Diary: Jac episodes, not just the ones you think apply to your problem, all. Prevention, as I show with Jac, is the best but retraining yourself and your horse will have its own rewards. As always…when having issues with the bit please check the horses teeth as shown in Episode 19. I rode for 18 years and now I drive for recreation & combined driving & pleasure shows. 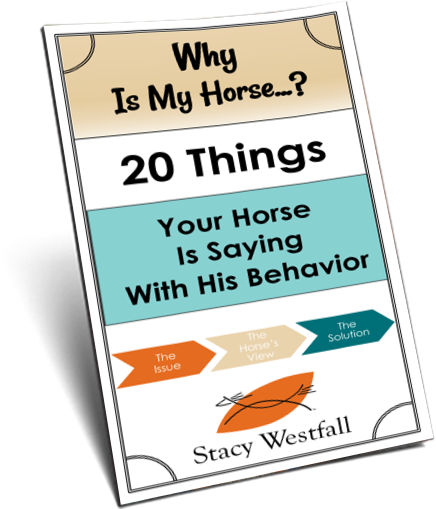 I have definitely dealt with a few hard mouthed riding horses, but it is most often the driving horses that I have found to have the hardest mouths of the planet. Since you’re only “connected” to the horse via the lines (in driving they are lines, not reins), it seems apparent that some people think they have to have a death grip on the lines at all times and pull the horse’s mouth back into their withers. One of the single worst cases of hard-hands ruining a driving pony I’ve ever encountered so far was with someone I know (a “trainer” mind you….) who got a “great” pony that supposedly was “perfect” for this person because he already came with a pre-installed hard mouth from years of heavy handed driving. Within 6 months trainer person was complaining constantly about the pony’s behavior, to the point where trainer person no longer even wanted to drive said pony. Pony had developed lameness (which of course was a result of the iron hands driving him and forcing him backwards into all kinds of unnatural working positions), and once pony got over said lameness, he was restless, irritable and apparently went from being a generally good pony to refusing to even walk. I got to drive him once, because trainer person did not want to drive the pony. I got into the cart and the second I did, the pony jigged and pranced away, there was no stop, there was no walk, there was just a high-headed, hard mouthed pissy prancing pacing all the way to the arena. When I proceeded to be unable to correct the pony’s behavior in less than 5 minutes, after months of having his mouth ruined, trainer person proceeded to lecture me on how to drive him, consisting of mostly “more hand” “harder this” “really pull” there. I was light with my aids and trying my hardest to get the pony to at least accept the bit at all, or even bend or actually just flex his poll even for a stride. It wasn’t happening. It was awful seeing such a good pony turn into a wreck from harsh hands. It wasn’t until sometime after this episode that this person worked the pony more with some help and supposedly got him going “better” (him— right, because the issues were the pony’s fault…) and then decided to become a trainer. Hello Stacy, this has nothing to do with the topic, but you once mentioned it was a dream of your husband to ride a horse across the USA. Mine too, so should you folks ever decide to do that, I would be interested to tag along! Why are people so reluctant to go bitless? great info up there….. some people try to steer their horse like they would steer their car….. they think if you cant make the turn… steer HARDER and Faster!!!! BTW…nice picture of you and your mom…and Scrapper….he is beautiful….